Having dirty windows around your property can give off an unappealing look and can even cause damage. Keeping windows in good shape takes time and effort, both of which can be hard to come by. When you want your windows looking their best but can’t seem to find the time, call a Gorilla to do it for you. Our Wetaskiwin window cleaning can have your windows looking great and lasting as long as possible! Each window is created differently, whether it is a part of a home or business. Some are oddly shaped or specially constructed but each are at risk of the same build-up and staining when left to the elements. Treating each of these requires special tools and care. 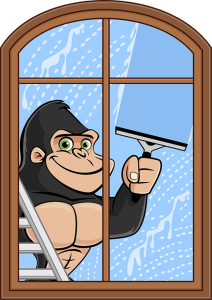 Instead of grabbing average household items in order to clean these windows, let our Gorillas do it for you. By using rubber tools and eco-friendly cleaners, our Gorillas get your Wetaskiwin window cleaning done safely and properly. With these tools, dirt is cleaned away from every corner and curve of your window instead of being pushed to the side. When you want proper results for your Wetakiwin window cleaning, there is only one phone call that you need to make and that is to a Gorilla! In the past, it has been very difficult to reach any windows that happen to be above the ground level. This can be a big headache for homeowners and commercial property owners with a more than single storey space. It is not uncommon to see an arm dangling out an opened window trying to scrub away stains. This technique is both ineffective and uncomfortable and that is why our Gorillas offer up a solution. Our Gorillas use all the right tools to get results for your Wetaskiwin window cleaning. By using Tucker Poles to reach glass, sills and frames up to four storeys, our results are always topnotch.